RBTH presents a selection of views from leading Russian media on international events, featuring reports on a proposal to ban the Hells Angels and the Bandidos biker organizations in Russia, Russia’s plans for Syria as opposition representatives visit Moscow, and plans by defense lawyers in the Bolotnaya Square case to challenge the position of the Russian authorities at the European Court of Human Rights. 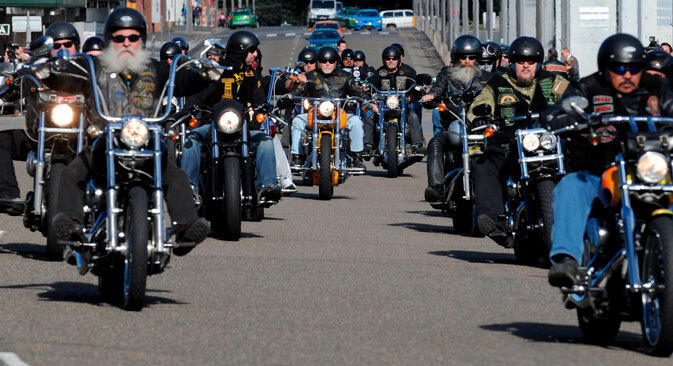 Russian Senator Andrei Klishas has appealed to General Prosecutor Yury Chaika to consider the possibility of recognizing two well-known American motorcycle clubs – the Hells Angels and the Bandidos – as “undesirable” groups in Russia, writes news website Gazeta.ru. Klishas, ​​known for his fight against organizations in Russia alleged to be so-called “foreign agents” (i.e. funded from abroad) referred to an appeal sent by the Anti-Maidan organization, in which it was stated that the two clubs could be used as the “main strike force” in efforts to implement a “color revolution” in Russia (with the goal of ousting the Putin regime – RBTH) writes the newspaper. However, political analyst Konstantin Kalachev, in comments made to Gazeta.ru, suggested that the appeal by the Anti-Maidan organization could be motivated by the desire to get rid of two rival biker groups. “This has long been discussed in the biker movement. And it is a sore point. Since pro-government bikers are an oxymoron. And that is why the ‘The Surgeon’ (Alexander Zaldostanov, head of nationalist Russian motorcycle club Night Wolves) would not like to see these names used by Russian motorcyclists,” said Kalachev. Valery Zaborovsky, spokesman for the Anti-Maidan movement, told Gazeta.ru that he rejected the assumption that the Night Wolves are interested in banning the American biker clubs. “I do not believe that these two would be able to create competition for the Night Wolves,” he said. The centrist newspaper Nezavisimaya Gazeta reports that delegations from the National Coalition for Syrian Revolutionary and Opposition Forces (NCSROF), which is considered a radical wing, paid a visit to Moscow on Aug. 13. The delegates, led by President of the NCSROF Khaled Khoja, held talks with Russian Foreign Minister Sergei Lavrov and Mikhail Bogdanov, deputy foreign minister and special presidential representative for the Middle East and North Africa, writes the newspaper. According to Nezavisimaya Gazeta, some observers believe that such a meeting could signal a change in the Kremlin’s position, previously assumed as being one of unconditional support for Syrian President Bashar al-Assad. In particular, the experts at the Voice of America radio service are considering this visit as the next step in Moscow’s gradual waning of support for Assad’s regime. Heydar Jemal, head of the Islamic Committee of Russia, also believes that “in its soul, Moscow has accepted the fall of Assad’s regime as a fait accompli,” writes Nezavisimaya Gazeta. According to the newspaper, Veniamin Popov, Director of the Center for Partnership of Civilizations at the Institute of International Studies at the Moscow State Institute of International Relations, noted that the focus of efforts of the Russian Federation was now clear: to persuade the rebels of the need to unite with Assad against their common enemy – Islamic State (ISIS). “They need to make it clear to the opposition forces that it is impossible to destroy the Syrian armed forces, thereby contributing to the success of the jihadists, and then afterwards destroy ISIS itself,” said Popov. “Now, a growing number of players are beginning to clearly realize that without Russia, they will not be able to cope with the challenges facing the Middle East today. Apparently, even the radical wing of the opposition is beginning to understand that without these contacts, they will be left behind,” said the expert. Lawyers for defendants in the so-called Bolotnaya Square case (a criminal case against members of the protest movement called “March of Millions,” which was held on Moscow’s Bolotnaya Square on May 6, 2012) have submitted their objections regarding the position of the Russian authorities to the European Court of Human Rights (ECHR), reports business daily Kommersant. Earlier, the Russian side, represented by Deputy Minister of Justice Georgy Matyushkin, sent to Strasbourg the government’s official position on the plea of the defendants in the Bolotnaya Square case, the newspaper reminds its readers. According to experts interviewed by the publication, it is rare that the Russian authorities undertake to send such a detailed and comprehensive response to the ECHR. The government official noted that on May 6, 2012, before the “March of Millions” on Bolotnaya Square, which had been sanctioned by the Moscow authorities, escalated into clashes with the police, there were no violations of the right to peaceful assembly. The defense, represented by attorney Irina Khrunova, claimed that no Russian court had provided a legal assessment of the actions of the police on that day. Moreover, the lawyer and defendants fear that the Bolotnaya Square case could also be used in the future to persecute other dissenters, writes Kommersant. After receiving the written objections of the defense to the position of the Russian government, the ECHR will have to set a date for consideration of the case, writes the newspaper.